The first international partnership in space wasn't the International Space Station. It wasn't even the Shuttle-Mir series of missions. 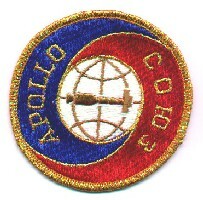 It was the Apollo-Soyuz Test Project, the first international human spaceflight. On July 15, 1975, an Apollo spacecraft launched carrying a crew of three and docked two days later on July 17, with a Soyuz spacecraft and its crew of two. Designed to test the compatibility of rendezvous and docking systems and the possibility of an international space rescue, the nine-day Apollo-Soyuz mission brought together two former spaceflight rivals: the United States and the Soviet Union. The United States launched an Apollo command and service module on a Saturn IB rocket. The Apollo spacecraft, while nearly identical to the type that orbited the moon and later carried astronauts to Skylab, was modified to provide for experiments, extra propellant tanks and the addition of controls and equipment related to the docking module. The Soyuz was the primary Soviet spacecraft used for manned flight since its introduction in 1967. The docking module was designed and constructed by NASA to serve as an airlock and transfer corridor between the two craft. 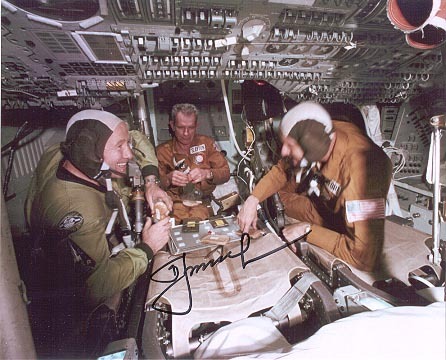 During nearly two days of joint activities, the mission's two Soviet cosmonauts and three U.S. astronauts carried out five joint experiments and exchanged commemorative items. The successful Apollo-Soyuz Test Project paved the way for future international partnerships. 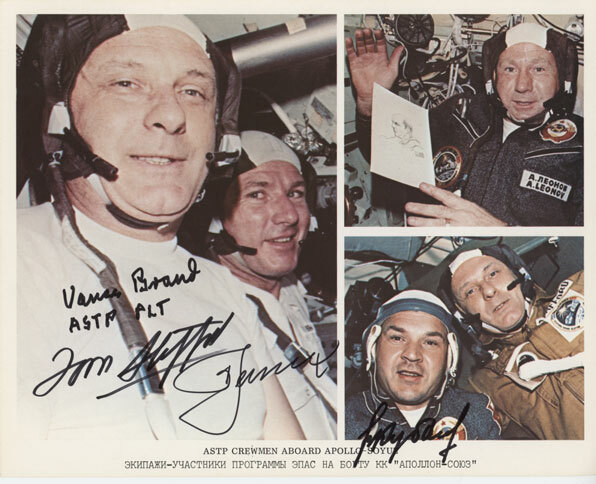 This mounted image measuring 16x20 has been signed on the matt by both the Amercian and Russian ASTP crews. It is dedicated to Mary and William Todd. Todd was a noted aerospace figure involved in a number of the early programs including Apollo. The signatures are bold and strong and the presentation is in great shape as you can see in the scan. This would look perfect reframed and would make an awesome addition to anyone's space memorabilia collection. Official NASA red stamped glossy portrait of the Russian ASTP crew, Alexei Leonov and Valery Kubasov. This is hand signed by both in black sharpie. NASA information is on the reverse. There is a small 1/4" closed tear in the top border that comes no where near the image itself. Otherwise is great shape. Signatures are a 10. This photo taken in the simulator also shows Vance Brand who could easily be added. 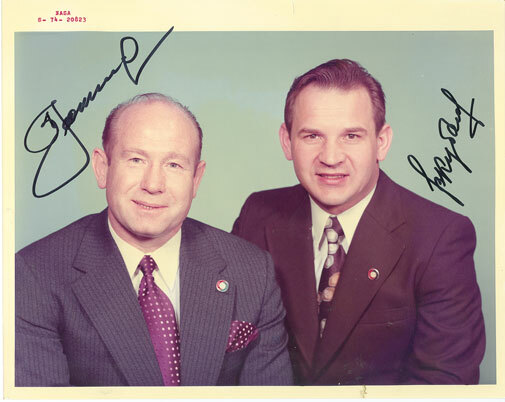 Hand signed by Leonov and Kubasov. 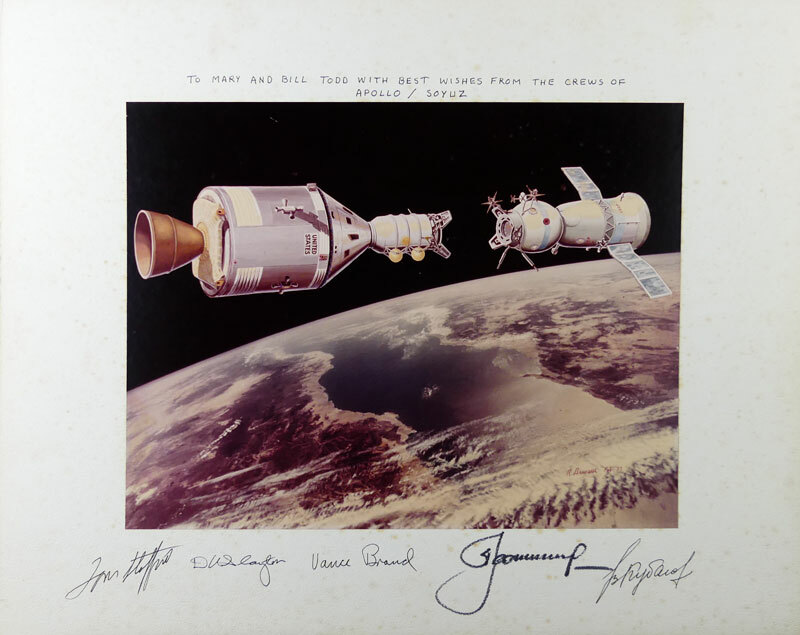 Vintage NASA litho from image taken during ASTP hand signed in black sharpie by Tom Stafford. Beautiful conditon. Measures 8x10". 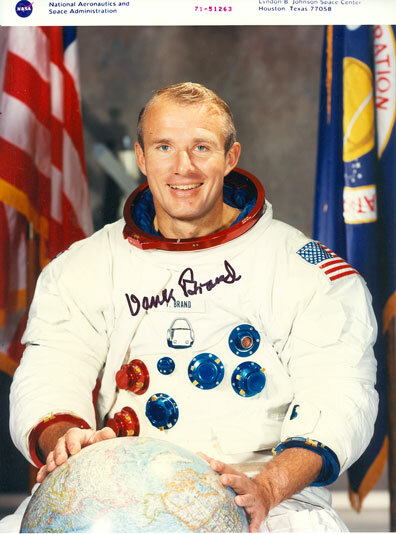 Awesome photo of Vance Brand in Apollo Space Suit. This is an official NASA numbered glossy. It measures 8" x 10.75" and is beautiful condition. It doesn't get any better than this! 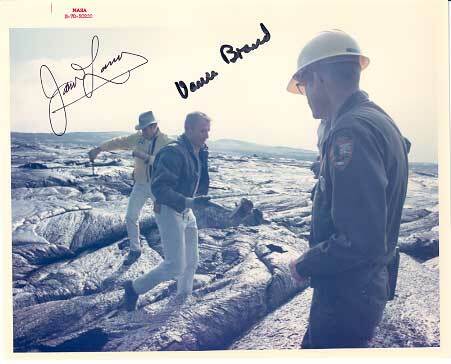 James Lovell & Vance Brand during geology training in a lava field . This vintage NASA red stamped photo is in beautiful condition. 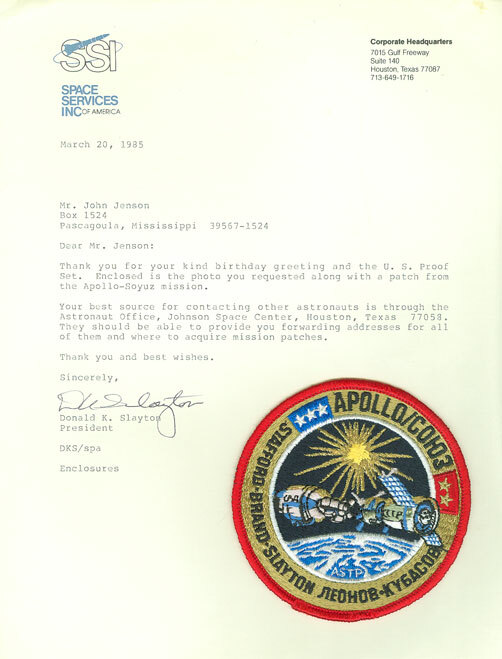 Deke Slayton letter as President of Space Services Inc. of America. Deke hand signs this letter from a fan requesting an autographed photo. Along with the letter he enclosed an ASTP mission patch which is also included with this lot. The letter and patch are in excellent condition. 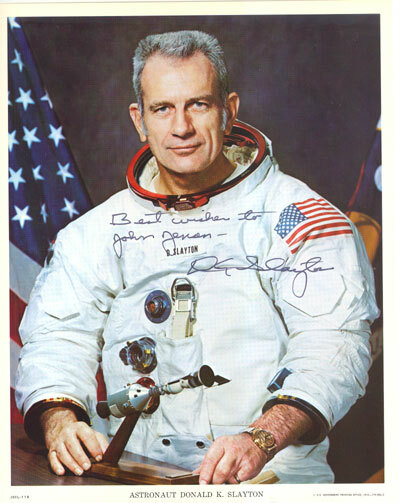 Deke Slayton hand signs his NASA WSS litho. Is inscribed to "Joan Tyson". Deke Slayton hand signs his NASA WSS litho. Is inscribed to "John Jenson". Deke Slayton hand signed index card. Measures 3" x 5"
Leonov in ASTP Simulator with Alan Bean (American backup CDR). 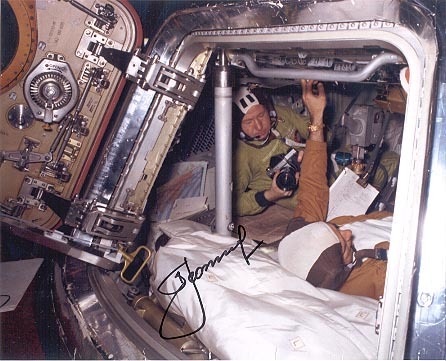 Leonov hand signs and adds mission information. Leonov and Tom Stafford historic hand shake in tunnel during ASTP. This is a page from a calendar. Leonov in ASTP Simulator with Tom Stafford and Deke Slayton sampling some food and having a laugh. 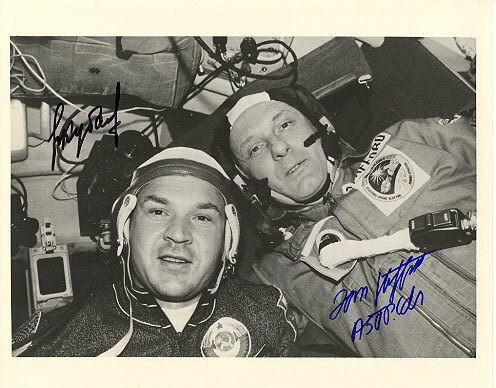 Leonov hand signs in black sharpie. 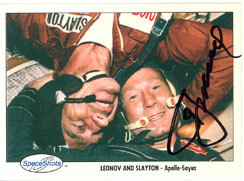 Leonov hand signed Space Shots card from Series Two (#0135). 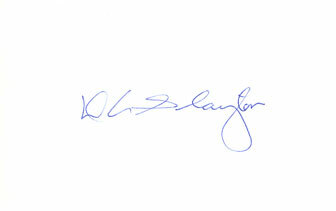 He signs in flight image with Deke Slayton in bold black sharpie. Mission information on back along with mission logo. 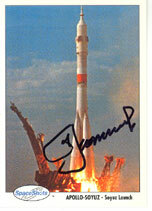 Leonov hand signed Space Shots card from Series Two (#0175). 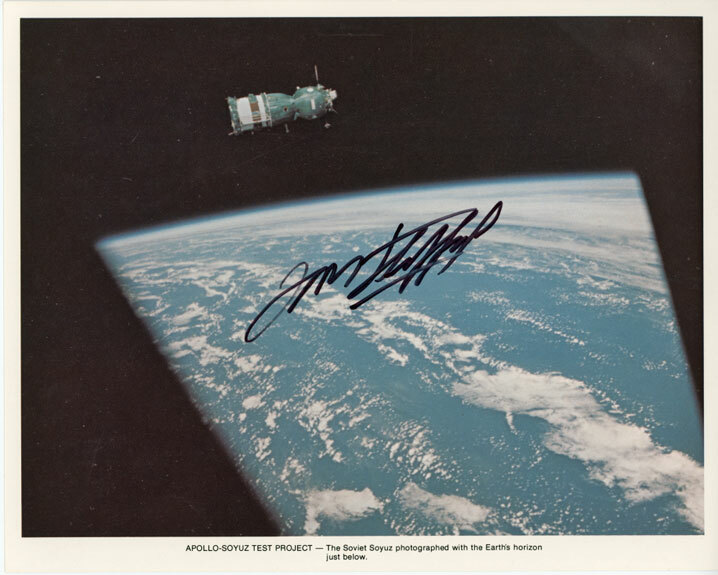 He signs image of ASTP launch in bold black sharpie. Mission information on back along with mission logo. pen and though contrast isn't great, is priced accordingly.